MoneyGram’s underlying money transfer business is shrinking. Digital (whilst growing) is still only 16% of the overall business. This is against the background of CEO W. Alexander Holmes stating in the earnings call on Tuesday: “Make no mistake we believe our cash network is an extremely valuable asset and one that we will leverage to win.” He continued later that the “…cash presence as sort of the value add side of the equation for both sends and receives and so we will be positioning ourselves that way and kind of pivoting the marketing a little bit.” 84% of the business is about to pivot. That’s a big pivot. On the plus side, there are some parts where the investment has at least caught up with the competition such as in digital onboarding. Margins are declining and whilst MoneyGram is certainly happy it did not lose the Walmart white-label contract, initial numbers from MoneyGram are that 85% of the customers using the new white-label service were already MoneyGram customers and with lower pricing in the new deal, they are cannibalising their base. 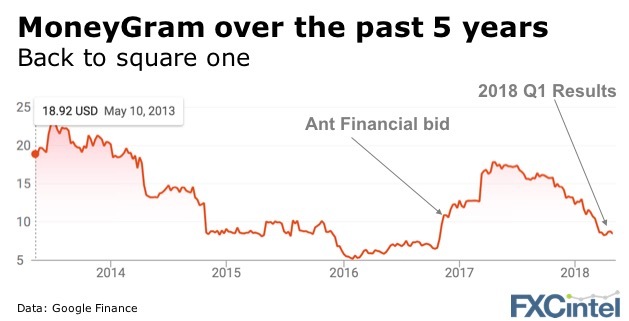 The value of goodwill (intangible assets such as brand) on MoneyGram’s balance sheet is $442m and is now higher than the value of the whole company ($415m). The market is either saying the underlying business is worth nothing or goodwill on the balance sheet isn’t worth what it’s marked at – but it can’t be both. Which leaves the obvious question – what’s next for MoneyGram? Can the business turn itself around and compete? Its digital revenue is only around $50m making it smaller than many of the new fintechs in the space. Since Western Union has shown no appetite for MoneyGram does that leave only Ria? Clearly this is not news to anyone. But how much of a premium can MoneyGram’s brand sustain if any at all? The Blockbuster & Netflix story reminds us of one truth for business. When you are out in front and one the leaders in the market, you still can’t rest on your laurels. Fintechs take note, someone out there is trying to disrupt the very business you just disrupted.